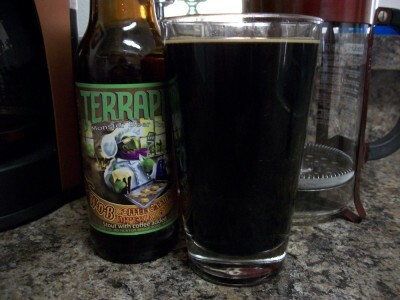 The Drink: Wake And Bake Coffee Oatmeal Imperial Stout from Terrapin Beer Co.
One of the original reasons that I got into craft beer was because I discovered coffee beer. It’s a search that took me to many liquor stores and bars until I found a coffee beer on tap at a local microbrewery called Dunedin Brewery. Since then I’ve discovered a number of more coffee beers, One of the ones that stood out from the crowd was Wake And Bake Coffee Oatmeal Imperial Stout from the Terrapin Brewing Co. Long name, but great coffee…I mean beer. Wake And Bake is made with Jittery Joe’s Coffee, an Atlanta Roaster. For you coffee geeks, there’s no information about the specific kind of coffee used, but if the quality of this beer is anything like this coffee, I wouldn’t mind trying a bag of beans from Jittery Joe’s Coffee anytime. So enough background, what about the beer you ask? Wake And Bake pours with a dark, dark chocolate color and light head. It was so dark that I couldn’t see through it even with a bright light behind it. The sip had a smooth, sweet chocolate flavor up front and lots of coffee towards the back. It’s a strong beer, 8.6% ABV, but the high alcohol content is kept hidden by the coffee flavor. Overall, it is a winner. It earned a 4.0 on the Passion For The Pint scale. It may not be appropriate for breakfast, but I won’t tell anyone if you don’t! Previous article Bohr From Cigar City Brewing: Too Much?